For those few who make their living from the internet (like me) it is easy to become unrealistic as to the importance and impact of what we do. When day after day we spend our lives in a virtual world that feeds off reality but is not really a part of it yet, we can easily imagine that we matter. But the truth is we are talking only to those who have access to computers and have become used to getting their information online. The majority of the world's population still read newspapers and watch television and the internet remains a strange and slightly sinister mystery to them. Times are changing, it's true, and gradually the net becomes accepted as a legitimate source of good information but it will be a long time before it shakes off the bad boy image of its early days. 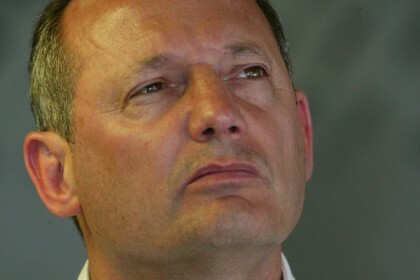 So I think the F1 bloggers must thank Ron Dennis for the boost in publicity he gave us yesterday. He has ascribed to us an importance that we dream about and, in the process, given me a chance to write about our relationship to the sport. For a start, I think he flatters our impact on the world and has a very one-sided view of what we are saying. Take a trip around the F1 news sites, blogs and forums and you will find as many McLaren supporters as detractors; you will find excellent sites that give solid and factual information and you will find completely biased and misinformed ones as well. Overall, I would say that it evens out and most F1 fans find the sites they like and stick with them; quality will out and only the best survive in the long run. What a pity that Ron seems only to have found the worst sites in his internet adventures. Had he looked at mine, for instance, he would have found staunch support throughout McLaren's troubles this year, perhaps even to the extent of exaggeration as I attempted to balance the nonsense preached by the other side. Most of us care about truth as much as anyone and find the gold amongst the garbage, just like real people, Ron. I suspect, however, that Ron does not actually have much time to surf the net a lot and he is reacting to what he is told, rather than from personal experience. And it is a fact of life that gossip tends to center on the worst and ignore the best. No doubt he has heard that misinformation has been spread by the net and that is certainly true; but it ignores the balancing fact that good information has also been conveyed by the medium and that people filter what they will from the mass of data they are fed every day. The truth is that the worst of the gossip and lies has originated in the traditional media. Examples are legion but, to take a very recent one, consider how words were put into Kimi Raikkonen's mouth shortly after his victory in the title chase. His reply to a loaded question with implications regarding McLaren's guilt in the spy scandal was "I think so, maybe yes." Forget that "maybe" - suddenly the headline is Kimi says title defeat "justice" for McLaren! But who asked the question and then twisted the answer? It wasn't a blogger - we are not amongst those privileged few who get to ask questions in press conferences. Surprise, surprise, Ron, it was one of that pampered fraternity, the "accredited" reporters of the traditional media. Ron should wake up to the fact that his real friends are not amongst the newshounds of the press but in the reviled world of internet reportage. If he really wants McLaren to have fair treatment from the media, he should tell those guys who run the McLaren website that, from now on, there will be no nonsense about only "accredited" journalists being given access to the inside information and images handed out. Let us have it, Ron, and don't charge for it as some do (it's advertising, for crying out loud, and who pays for that? ), and we'll make sure your company gets a full and fair hearing. Take a look at Renault and what it is doing on the net. Think about how Flavio can say the most outrageous and ridiculous things and not be reviled as you have been. And then change your website's policy and let us in - you'll be amazed at how civilized we are. Give the bloggers a chance, Ron! I might go further and say that bloggers are more interested in the truth than are these "accredited" journalists. Take the AP for example. They regularly sluice through local newspapers and reprint the story with an AP copyright, often leaving out important details and keeping only the salacious content and dress it up with an eye-catching headline. It is only the AP's accredited journalists who can take the fact that Bangkok is sinking by 4 inches per year and make it into a story about global warming threatening to submerge it. Still, many sites do open up only to these "accredited" journalists who are more interested in sensationalism than in reporting truth or generating serious and thoughtful debate. This site is a perfect example, a place where the hype of the news is carefully sifted through, the small nuggets of truth found and although it often leaves more questions than answers, the questions are the important thing. The right question asked at the right time makes all the difference. Hear, hear, AJP - it is time that the unsavory practices of the traditional media were revealed and that our information no longer be filtered by those who think they know what's best for us. The blogs have broken open the enormous cache of information created every day and now we can find out for ourselves what is happening, rather than believe what those with vested interests tell us. AJP mentioned "global warming" ...... now there's a story full of "acredited" MEDIA "facts" !!!! I fully agree with Clive's assesment, McLaren needs our support to balance the grossly negative "acredited media" but how one uses the support has to be balanced also. Consider a story this morning on formula1sport; McLaren appealing to avoid criticism - Whitmarsh .... Has McLaren taken our support to mean they should pursue this foolish "cool fuel" appeal? Whitmarsh claims continuing the appeal is to: "avoid the criticism of fans and formula one insiders”. Somethings gone wrong, fan support is one thing but this isn't what we had in mind! McLaren did not appeal any of this summer's proceedings (knowing full well they'd never get anything overturned) why are they trying this appeal, knowing the results will be the same? Somethings wrong in the front office. I agree, Number 38, it does look as though McLaren have got this one hopelessly wrong. Maybe the pressure has finally got to them. It may be only one set of fans they are concerned about, those of Lewis Hamilton. They would not want to alienate his supporters who may feel that he was unjustly denied what they had assumed was his for the taking. However, I think they are wrong in this, Hamilton and even his staunchest supporters feel the title is decided and that Raikonnen should remain champion. As you said Clive, Ron is probably not that familiar fith the workings of computers and internet. Well, maybe computers in the aspect of running diagnostics on his cars, but not with an internet connection. Beeing a manager of one of the most successful teams in F1-history is presumably quite time-consuming, so i can understand him. But i have to address that all that he says gets to both internet and the regular news, so please think things through before saying anything that might piss one or the other off. If a blogger hears from his favourite team that he just does damage to their reputation, because hes on the internet, it might trigger him to do just that. Bloggers don't have any regulations as of what they say, so what they say can do considerably more damage than what the papers say. Things written on the internet has a tendency to get read by the other medias, transfered, upsized by a thousand, and then published again. Without the original author having even the slightest chance to have his say about it beeing used. So, it could be said that there's kind of a war going on bethween the new media and the older counterparts. And in war, as you know, everything is allowed. There by the ones who get squashed inbetween get hurt the most. All true, Björn, although it's more like an invasion than a war. The press increasingly goes online as they realize that the future lies here, not in the printed word. In time, I think the blogger will come to accept that there are responsibilities that go along with the freedom of the internet. There is a form of self-regulation in that we all read each other and, if anyone gets something wrong, he soon gets told! Yes, it's a bit wild at present but given time, I think it will mature and be more ready to take over from the traditional media. OK Clive--What we have right now is that the majority of people get their news form TV or the press. Because it has been this way for so long the general public has given the media too much 'faith" that what is reported is actually "true". Your example of the Kimi "mis"quote is a perfect example. The real problem is that when it brought to light it is pushed off as a rareity or a fluke. The reality is that most people being interviewed today mind what they say. As a result the only way to sensionalize it is to make it sensational by any means. Press is very Machiavellian. The reporters are all cutthroat. But here in cyberspace we tend to be more careful. Not just in what we believe but also in what we say. If we say something that is not true we are told right away by someone else. Thus we tend to be more conservative in our reporting. If Max would read more web sites as well as let some bloggers on to his web site he would find it nicer. But I do believe that there is a strong move to responsible blogging as people realize that it's quality that gets the customers in the end. You can up your ratings for a day or so with sensationalism but they're all gone in no time if you can't come up with something even more shocking. The ones that stay are the ones who genuinely want good information, not titillation, and that is the F1 blogger's market. Maybe I am old fashioned but to me the truth is what matters. If I find a web site that is all about "the story". Or a site that I know is not being truthful I am gone. But in the US one of the highest selling publications is the National Inquirerer. Which we (responsible people) know is all lies. It is like an accident on the highway--you know you should't look but you do. When bloggers say "whatever" without checking sources and such they open themselves up to criticism from other bloggers. Now if you have a blog (like you Clive) for you to sell advertising you have to stand on your hits. You will get initial hits but if you are not stradleing the line of sensationalism vs. (and) truth you will not get re-hits. Your blog is one of my day highlights and I would support your sponsers. But there are other F1 sites that are full of sh*t I would not support them. It is my fear that those are the sites that Ron was told about. As you said before negative sells that is the way it is. Look at your local news, it start with fires then murders and so on. The feel good stories are at the endof the program. In work, one "OH SH*T" erodes 100 "THAT A BOYs". But it is my feeling that honesty will prevail. I hope that there is a way to make Ron Dennis aware of your blog. Your stories are well written and researched. Keep up the good work. Thanks very much, John - your support is much appreciated. As you know, the blog is essentially my opinion based on the facts I have gleaned. Sometimes I can be wrong but I am always open to other views and to being corrected. What I don't like to see is when people are convinced that only they have all the facts and that everyone else is obviously wrong, therefore. That's the sort of attitude that produces the bad image that Ron is picking up about the internet. What I find hard to believe about Max is how can someone who is so stubborn (to a fault) could rise to the position he attains. Have you ever heard of the Pauli Principal. It says that people are promoted higher until they reach a position that they can not handle. If I recall this was just a theory, but Max had made it a reality! "people are promoted to the level of their incompetence"
As Alianora often points out, Max did a lot of good things for F1 when he first came to power. Much of the improved safety over the last decade is attributed to his rule changes. The problem is that power seems to have gone to his head and he has become adamant that he is always right; at the same time, his decisions become ever more unrealistic and destructive of the sport. At times I wonder whether he actually has some kind of progressive mental illness that is driving all this. Clive, you said in a comment above: "What I don't like to see is when people are convinced that only they have all the facts and that everyone else is obviously wrong"
There is a word for people like this on the 'net: fanboys. I wonder if Ron is confusing blogs with internet forums - if indeed he'd know the one from the other and isn't just lashing out at the nearest available object. It's true about the quality of the best F1 sites - many of them are just as good as the printed equivalent, sometimes even better. And I wouldn't miss one of your articles for anything, Patrick. When I comment I always try to start with "in my opinion" or "I feel that". I do this as to let everyone know that it is my opinion not fact. When I quote I give the source. Often it is Clive, or Kieth or some one of good quality. The problem I see on the forums is people believing in what others are saying as if it were fact. Now on F1 sites it is not as bad as other forums (either different subjects or similar). I attribute this to two things. First: Many F1 fans are at or above average intellegence. (really). Second: No where do you find such passion for a sport as you do in F1. I hear that football (soccer) has just as much passion. (I do not read any such posts or read any forums). This is why we need to police ourselves. We have to remember that this is just a sport. Alot of people let it effect their lives. They are happy or sad for the week according to the winner. I myself have learned to seperate my deepest emotions from sports. Having done this I look at things with a much greater open mind. Also what we write is read by total strangers who have no idea whether we are serious or not. Another thing that I try to do. Avoid getting personal. Now this year I couldn't hold in my feelings for Alonso (right Clive?). I do this because I don't know him personally. About a week ago Suzie made me remember this personal rule that I try to give myself. I was being very, very hard on FA and I did not have to go that far. We should also not get angry at another poster or blogger for that matter, eveyone has their own opinion and this is the forum for them to voice it. I feel that blogging posting ect. is a perfect example of freedom and liberty. Nothing spreads what we Americans take for granted so quickly and efficiently. Although we don't have to agree the beauty is that we don't have to here. We must realize that this story and all the others have 3 sides. 1.yours 2.mine 3.THE TRUTH. Every story boils down to this. It is these things that Max's minnions need to understand. For every negative story written this year about McLaren there were at least one or more good stories (most at the cost of Ferrari or the FIA). I agree Clive that I also cannot see Max getting home from work and checking out any web site other that Ferrari's. One should always keep an eye on the competition. All we need is a little birdie to wisper in Max's ear about this site and a few others. Because these few sites trully have intelligent people who agree to disagree sometimes but strive to "get it right"!! That's quite a manifesto, John. And I agree especially that F1 fans are, in general, more reasonable and open minded than the fans of sports like football (soccer). I have always said that this is because of the wide range of disciplines they have to understand - engineering, tire technology, aerodynamics, driving techniques, motor sport law, history, etc. - before full enjoyment of the sport can result. One of the first things that happens when we begin to learn is that we realize how little we know. And, as the process continues, we become humbled by the depth of knowledge of those people who are actually involved in the sport (that is why it was such a disappointment to me to hear of the antics of Stepney and Coughlan - they ought to have been above such stupidity). To recognize the limits of one's knowledge is to become open to the possibility of being wrong. And that, my friend, is the beginning of wisdom. I call things as I see them but I hope I would never presume that only I am right. And now you've got me philosophizing. How the heck did you manage that? I could do a really long entry on this subject - the effect of bloggers on the outside world is a hot topic in information and library science at the moment - but I'll try to keep things reasonably brief. Ron Dennis does not strike me as someone who uses the internet to keep up to date on F1 either - in fact I suspect very few F1 people do. There are a small number who may log on long enough to check how things are on their own forum, but the kind of wider reading bloggers like us tend to do is still a foreign habit. Not that this surprises me, since most of them don't even try to get a balanced view of the traditional media's perspective either. Ron's gone on record in years past to that effect. As a result, all he gets is the hearsay, and since most of the bad hearsay is still from credentialed journalists, it's not surprising his view is bad. He probably thinks that all the rubbish these journalists come up with is triggered by 14-year-olds from Belgium or something... This antagonism doesn't help his image, as Clive rightly says. If he could get a couple of people on his team to sift through the internet, he'd probably benefit quite a lot - there are quite a number of good thinkers among the bloggers and sometimes their strategies are better than the ones McLaren (or other organisations) end up adopting. True, Alianora. I think it's a case where Ron should stop complaining about the net and do something about it. He might then find it's not really half as much of a problem as he thought. Quite a debate here. Someone should email a the address of this site to McLaren. The nice thing about blogs, at least in this case, is that if a knowledgeable individual thinks does not agree with your statements he can call you out on it.... you can't do that in newspapers (for good reason). That being said, I think that 'blog reading' is somewhat of a developed skill. Assuming you know nothing of the blogged information you have to look to the comments and make your judgment based on how others responded to the writings. The author can be biased, but someone is going to argue the counterpoint, again unlike a newspaper which states his views with no rebuttals. A newspaper can rarely break a story like it used to before 10PM new casts and especially the internet. So instead they have to flare it up so you'll buy information that you could otherwise get for free, and much quicker on the internet, albeit with a grain of salt. and if your are reading this, let Alonso go, I can bring .4 sec to your team!